"How could I possibly explain using the military to destroy the nuclear facilities of a country the intelligence community said had no active nuclear weapons program?" If you want to be like the folks on the hill"
On October 12, Politico posted a copy of the predetermined topics of discussion for this evening's third and final presidential debate in Boca Raton, Florida, the focus of which will be foreign policy. No, instead, two grown men vying to be the most powerful person on the planet, will trip all over themselves to prostrate themselves at the altar of Israeli fear-mongering, gloating about how much Iranians are suffering because of US-imposed sanctions, cyberattacks, sidewalk executions, covert operations, industrial sabotage, economic hardship and hyperinflation and threatening to launch an unprovoked military attack if Iran doesn't do as its told by the United States. These actions are intended, we will hear from President Obama, to stop Iran from acquiring a nuclear weapon; or, in Romney's case, to prevent Iran from achieving nuclear weapons capability - that is, the point at which Iran will have the technical, technological and scientific ability to theoretically begin the process of assembling a single atomic bomb, if the leader of the country were to ever make that decision, which at this point everyone agrees he hasn't done and probably won't ever do. U.S. Defense Secretary Leon Panetta, Joint Chiefs of Staff chairman Brigadier General Martin Dempsey, Director of National Intelligence James Clapper, Director of the Defense Intelligence Agency Ronald Burgess, CIA Director David Petraeus, President Barack Obama, his National Security Council, and Vice President Joe Biden have all agreed Iran isn't actively building nuclear weapons. Israeli Defense Minister Ehud Barak, IDF Chief of Staff Benny Gantz, and Military Intelligence Director Aviv Kochavi have also said the same thing, as have other foreign intelligence agencies. A number of former Mossad and Shin Bet chiefs have repeatedly warned against warmongering about the Iranian nuclear program, let alone an unprovoked military attack. Furthermore, the International Atomic Energy Agency (IAEA) continually confirms - that Iran has no active nuclear weapons program and has stated it has "no concrete proof that Iran has or has ever had a nuclear weapons program." (emphasis added) In November 2011, a spokesman for the Obama White House concurred, "The IAEA does not assert that Iran has resumed a full scale nuclear weapons program." "Claims of an imminent Iranian nuclear bomb are without foundation," IAEA spokesman Georges Delcoigne stated on May 9, 1984. In 1991, then-IAEA Director-General Hans Blix explained that Iran's efforts to acquire nuclear technology was "no cause for concern" while the following year, IAEA inspections in Iran found no evidence of illegal nuclear activity. Years later, in November 2003, the IAEA affirmed that "to date, there is no evidence that the previously undeclared nuclear material and activities referred to above were related to a nuclear weapons programme." And the following year, after extensive inspections of Iran's nuclear facilities were conducted under the auspices of the IAEA's intrusive Additional Protocol (implemented voluntarily by Iran for two years) the IAEA again concluded that "all the declared nuclear material in Iran has been accounted for, and therefore such material is not diverted to prohibited activities." Despite the appointment of Yukiya Amano, America's man in Vienna (and self-declared as "solidly in the U.S. court on every key strategic decision"), as IAEA Director-General, the agency has continued to verify Iran's safeguard commitments. Nevertheless, Iran has consistently offered curbing and capping their enrichment program, accepting international cooperation, and has actually taken serious scientific and technological steps to reduce its medium-enriched uranium stockpile, thus decreasing the perceived threat of any nascent Iranian "breakout" capacity. Unlike Iran, which doesn't have a single nuclear bomb, Israel maintains a massive, undeclared and unmonitored arsenal of hundreds of deliverable nuclear weapons. Additionally, Israel has never signed the Nuclear Non-Proliferation Treaty and consistently refuses when repeatedly called upon to do so by the international community. The hypocrisy is staggering. Meanwhile, Iran has long supported the establishment of a Nuclear Weapons Free Zone in the Middle East. Tonight, Obama will praise his policy of collective punishment of a civilian population over a nuclear weapons program he has admitted doesn't even exist while Romney will call for even more destructive measures to hurt the Iranian people. Sanctions target Iran's citizens with the hope of causing enough suffering to instigate regime change. That won't happen. In the meantime, the Iranian people suffer for a crime their government isn't even committing. While Mitt Romney will surely scold the president for "not supporting" the so-called Iranian opposition following the election in 2009 (even though no dissident or reformist leader or group asked for "help" from the U.S.; quite the contrary), we won't hear that Iranians across the political spectrum uniformly oppose sanctions and wholly support their country's indigenous nuclear energy program. 7. Attacking Iran is not only immoral, it is incontrovertibly illegal. Dan Meridor, Israel's Minister for Intelligence and Nuclear Energy as well as a Deputy Prime Minister, revealed the problem in perfectly simple - and excruciatingly patronizing and imperial terms - in April 2011. "No more the responsible adults tell the kids what to do," he told the Sydney Morning Herald. "When everybody has the bomb you can't contain or control or interfere as America could do." The same month, hawkish American Enterprise Institute maven Danielle Pletka admitted, "The biggest problem for the United States is not Iran getting a nuclear weapon and testing it. It's Iran getting a nuclear weapon and not using it." Yet even the mere "breakout capacity" is what worries Israel most. Writing in Asia Times this past summer, Richard Javad Heydarian explained that "the Iranian nuclear issue is fundamentally about the balance of power in West Asia. Israel is essentially concerned with the emergence of a 'virtual' - possessing a 'break-out' capacity to develop a warhead on a short notice - nuclear-armed state in Tehran, eliminate Israel's regional nuclear monopoly. This would undermine Israel's four decades of strategic impunity to shape the regional environment to its own liking," adding, "Thus, it is crucial for Israel to prevent any Iran-West diplomatic compromise, which will give Tehran a free hand to enhance its regional influence and maintain a robust nuclear infrastructure." Earlier this year, former CIA and NSA chief under George W. Bush, General Michael Hayden essentially confirmed that opposition to a nuclear-capable Iran has nothing to do with proliferation fears or international law, but rather regional hegemony and regime change. "It's not so much that we don't want Iran to have a nuclear capacity, it's that we don't want this Iran to have it," Hayden told a gathering of analysts, experts and journalists at the Center for the National Interest. "Slow it down long enough and maybe the character [of the Iranian government] changes." The reason we'll be subjected to a quarter-hour of Obama and Romney talking about our unbreakable, unshakeable, sacrosanct, unique special bond and unflinching commitment to Israel's security, how the United States will never allow Iran to threaten our "number one ally in the region," how bumbling, bipolar used-car salesmen are deployed by an evil regime to assassinate our best friends' ambassadors and how Iranian leaders threaten Israel with genocidal destruction (something they've never actually done), is because, that way, we won't hear the words "Palestinian human rights," "Israeli war crimes," "apartheid," "occupation," "Gaza," "colonial settlements," "African migrants in internment camps," or "ethnic cleansing." October 23, 2012 - While the debate last night went pretty much as expected, one thing specifically caught my attention that perfectly illustrates the absurdity of the political narrative when it comes to Iran. "Would either of you be willing to declare that an attack on Israel is an attack on the United States, which, of course, is the same promise that we give to our close allies like Japan." Both candidates naturally jumped on this opportunity to declare their undying fealty to Israel and boast of their willingness to come to its aid in such a dire circumstance. 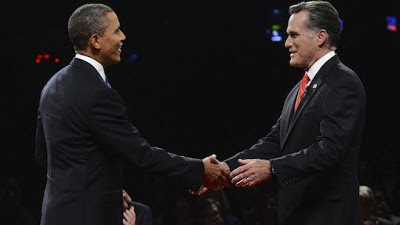 Obama insisted, "I will stand with Israel if they are attacked," while Romney bizarrely stated, "If Israel is attacked, we have their back, not just diplomatically, not just culturally, but militarily." Culturally? Ok, then, but whatever, we know his thoughts on "Israeli culture" vs. "Arab/Muslim culture." While this is all unsurprising, later in the debate Schieffer asked essentially the same question but from a different angle - this time around Israel was the aggressor, not the victim of an attack. He asked Romney, "What if the prime minister of Israel called you on the phone and said, 'Our bombers are on the way. We're going to bomb Iran.'" What was Romney's reply? "Bob, let's not go into hypotheticals of that nature," he said, before taking the conversation in a totally different direction. So, apparently, Israel unilaterally attacking Iran - a scenario we hear about daily from not only U.S. officials and media but also directly from the mouths of Israeli officials - is a silly "hypothetical" undeserving of consideration or serious reflection, while a unilateral Iranian attack on Israel - something that literally would never happen and which Iranian leaders have long insisted would never happen - is a reasonable subject worthy of a lengthy response. Such is the shameful reality of our political discourse. The debate went a bit differently than expected. Romney did in fact call Iran our number one threat, but to his credit Obama did not. He cited terrorism. Both did try to stumble all over each other over who would be a better friend to Israel and it was frankly a bit embarrassing. I read your blog for a number of reasons the most important being that you stick to facts. I was a bit disappointed with this one. I felt you were misleading in two areas. First, the IAEA statements you reference are all dated. I'm not alleging that Iran is pursuing a nuclear weapon, but I do think the dated material can be misleading. Second, you state as fact that Isreal has a massive nuclear arsenal. While that is probably true, it could also be a very good bluff and should not be presented as a simple truth. After the Iraq war, no one should be confident in the US's intelligence regarding any country and I am baffled at why people are so convinced that we are definitely right about Iran's intentions or capabilities. That said, there are obvious incentives to obtaining said weapon that have nothing to do with using it.